The people will get the information about the Health Department Gujrat Jobs 2015-16 on Disabled Quota for Class-IV Eligibility Criteria. The people will get the best updates given out for you. 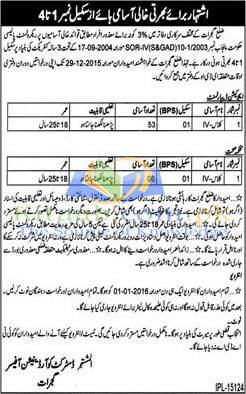 Health Department Gujrat Jobs 2015-16. The positions which are vacant are Education Department Gujrat 53 Class-IV (BPS-01) Health Department Gujrat 06 Class-IV (BPS-01). The updates will be given here time to time for you.